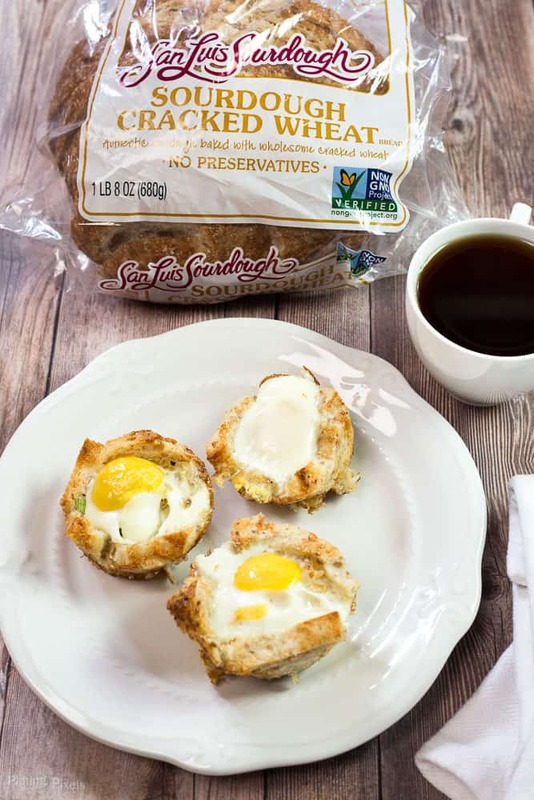 Savory breakfast muffins with these easy Sourdough Ham and Egg Muffin Cups. Crispy sourdough bread with cheddar cheese, ham, green onion and an egg baked in the center. 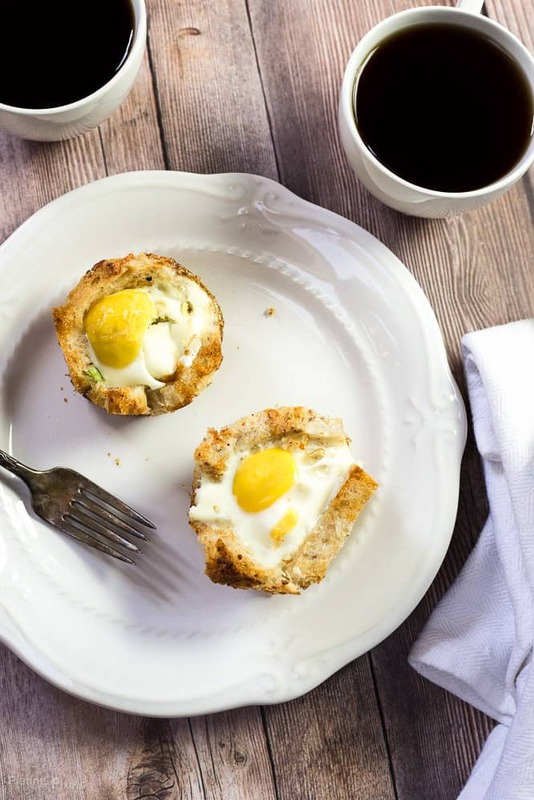 Within this recipe post you’ll make a fun and easy breakfast, that’s great for on the go. Plus you’ll learn about sourdough bread…how’s it made and what’s a sourdough starter? Growing up bread was a big part of our family. Sandwiches were often a go to as they’re a quick, easy and tasty meal. At the early age of 6 I was the master of grilled cheeses. Traditionally you think of sandwiches for lunch, but you can enjoy bread, especially sourdough, for any meal. 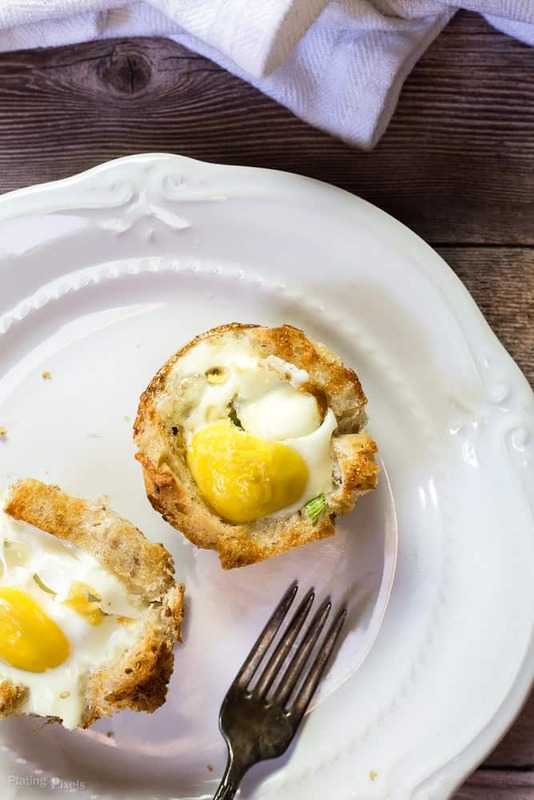 These sourdough Ham and Egg Muffin Cups are a fun breakfast you can make with sliced sourdough. I would have loved to make these sourdough muffin cups as a kid. It combines some of my breakfast favorites. 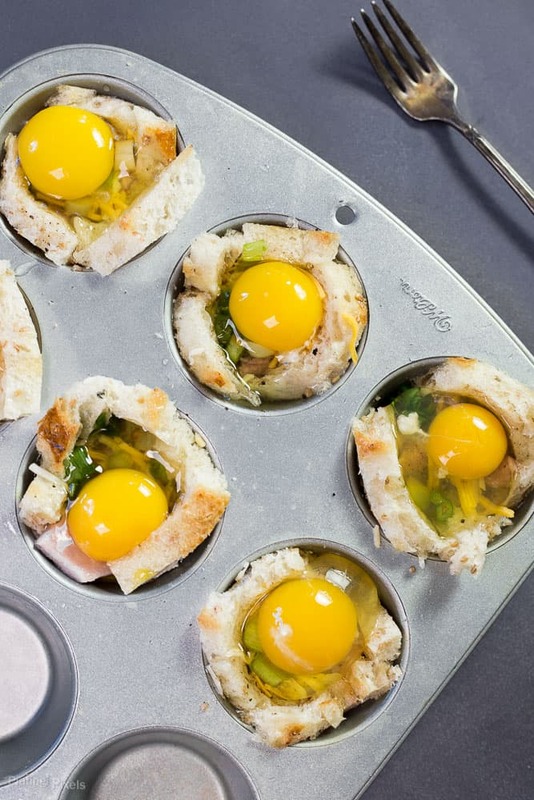 Eggs, ham and cheese, and loads them into a crispy sourdough muffin cup. Baked with soft, tender and crispy textures all mixed together. Plus you can eat these with your hands and it’s totally fine; no table manners needed here. Or you can take them on the go for a quick breakfast at work beyond your basic cereal. Olia and I have a favorite bakery in Santa Cruz where we go to get fresh sourdough loaves, paired with cheese, for a romantic and relaxing day at the beach. When we can’t drive down there or the weather isn’t ideal, buying sourdough at the store is the next best option. What is sourdough starter and how is sourdough made? Sourdough bread is made by fermenting dough using naturally-occurring lactobacilli and yeast. The baked bread has subtle sour taste (hence the name) caused by lactic acid produced by the lactobacilli. Other breads use just yeast, which does not create this unique flavor. Sourdough requires a pre-ferment, or starter. It’s made of flour and water and contains microorganisms. It produces a vigorous leavening effect and adds flavor. Some batches of starters are passed from generation to generation and have been around for years. Technically you be having the same flavored bread from decades ago. Flavor profiles: Rich and savory. Eggs, ham and cheese create a classic breakfast combo. Paired with distinct sourdough flavor. Texture: Soft, fluffy egg in center of crisp sourdough bread. Dietary Options/Substitutions: For vegetarian omit ham. Crispy sourdough bread with cheddar cheese, ham, green onion and egg baked in center. Preheat oven to 375° F. Grease a regular sized muffin pan. Cut crust from sourdough and cut pieces in half vertically (full pieces will be too large for muffins). Flatten pieces by hand or with a roller to thin out. Brush both sides of sourdough with olive oil. Place slices in each muffin cup, pressing down to bottom and on sides to create a cup shape (the edges will stick up over the pan and crisp while cooking). Sprinkle ham and green onions in bottoms, then crack one egg into each. Sprinkle cheese on each and add salt and pepper to taste. Bake for 15-20 minutes, or until sourdough is crispy and eggs are cooked to desired doneness. Cool slightly on a wire rack then remove from pan and serve warm. Extras can be stored for a few days covered in the fridge. This would definitely help. You could bake a whole dozen even pretty quickly or make it ahead of time. Thanks! I make egg cups all the time, but never thought to make them with sourdough bread. I bet it tastes great. Sourdough works perfect for these. You should totally try it Chrystal! These look great! I love eggs in a hole because the bread soaks up the yolk perfectly. I bet this is similar! I’ll have to give it a go. The bread creates perfect cups cooked like this. You totally should Sarah! OH I love this. Prefect for breakfast on a busy morning. It sure would be! Plus you can make a batch ahead of time. Thanks January! I will have to try this out, looks super good! I love my egg sandwiches, but this will be a little something different… thanks! It’s similar but the sourdough gets a bit more crunchy. Plus it’s easier to eat. Thanks Eloise! This looks just absolutely delicious! I will have to try it. I love anything breakfast like. Breakfast is awesome, anytime. Thanks Bella! It’s like taking eggs in a basket to the next (easier) level. Will have to try it! So much easier, especially in bulk. Thanks Chrisy! I just want to dive into this with a nice mimosa in hand! Haha that sounds like a good idea Rhiannon! Thanks so much Colleen! I’m pretty sure a toddler would find these fun to eat! It’s pretty common ingredients so they can be made almost anytime! Thanks! What a great idea. I love that you can make a bunch at a time for a crowd by using the muffin pan! It works be perfect for a large crowd. Lot easier to cook than individual eggs in toast on a pan. Thanks Mary! A perfect breakfast idea. These look absolutely delicious! They totally are. Thanks Shannon!